Military Recruiting: Are We Passing The Test? Nearly one of every four high school graduates can't pass the basic military entrance exam. Combine that with high obesity rates and a rise in criminal records, and the pool of potential military recruits is getting very shallow. 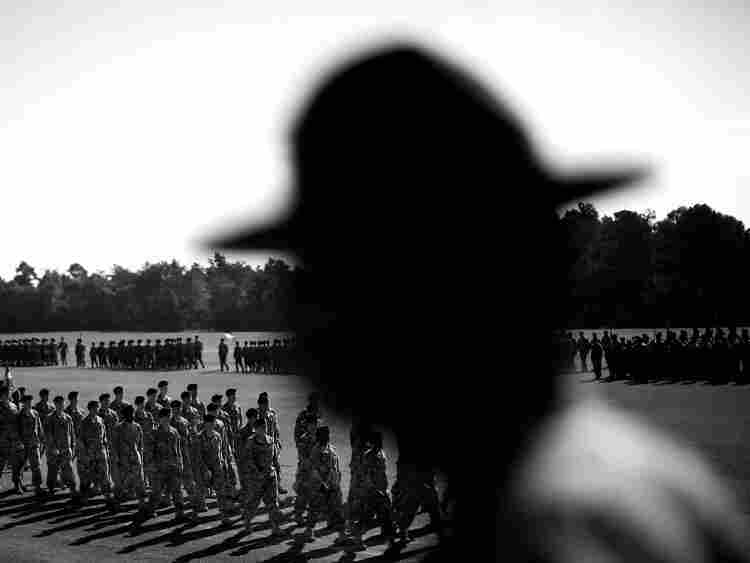 A drill seargent watches the basic-training graduation ceremony at Fort Jackson, S.C. The Pentagon and former military leaders are worried about a new report that shows many high school graduates can't pass the military's entrance exam. Nearly one of every four high school graduates can't pass the basic military entrance exam, a new report shows. Combine that with high obesity rates and a rise in criminal records, and the pool of potential military recruits is getting very shallow. Every branch of the military is still reaching its recruitment goals, but the Pentagon's recruiting chief says he's worried. And a group of former military leaders is calling for significant changes in the educational system, calling the ineligibility rates a matter of national security. The military's Armed Services Vocational Aptitude Battery exam -- known as ASVAB -- is the world's most frequently used aptitude test. It includes 99 questions each potential recruit must answer. One sample: "If three plus X equals six, what is the value of X?" The minimum passing score is 31. According to the new report by the nonprofit Education Trust, called "Shut Out of the Military," almost 25 percent of potential recruits can't reach that level. The Trust's vice president, Amy Wilkins, tells NPR's Jacki Lyden that those results have big implications for society as a whole. "The workforce of the Army so closely mirrors the civilian workforce," she says, "that if kids aren't ready for jobs in the Army, they also aren't ready for jobs in the civilian workforce." African-American and Latino kids have higher-than-normal failure rates, the report says. That's troubling, Wilkins says, because those two ethnic groups make up a big chunk of today's armed forces. Test scores are not the only thing keeping potential recruits out of the military. Earlier this year, we learned that more than 9 million Americans of prime recruiting age exceed the military's weight limits. All those ineligibility problems worry people like Jamie Barnett. Barnett is a retired rear admiral in the Navy, and a member of the organization Mission Readiness, a coalition of former military leaders who are focused on these high ineligibility rates as matter of national security. "The military is much more technologically sophisticated now," he tells Lyden. "We need people who can operate complex sensor systems, weapons systems, aircrafts, nuclear reactors." In an attempt to ensure that newer recruits are better educated and prepared for service, Barnett is urging Congress to focus once again on early childhood education. He believes that moving away from a kindergarten-through-12th grade education system to include pre-kindergarten can have a real impact. "We know what we can do," Barnett says, "but they take a long time to take effect. We have to start now." Now, despite all of these obstacles, the Defense Department says its recruiting numbers are on target. In fact, with the economic crisis and a new, more generous GI Bill, the Army and other branches of the military are seeing longer waiting lists than usual. Dr. Curtis Gilroy, the Pentagon's point person for recruitment of the active duty force, admits that the military is troubled by the new report and recognizes that "higher-aptitude individuals are much easier to train and they perform much better on the job." One of the key measures, he says, is a high school diploma. Pentagon studies have shown that high school graduates have a proven record of successfully completing their term of enlistment. As a result, military recruiters are pushing potential recruits to get diplomas. "It's important to us in the military because we are a selective and discerning employer," Gilroy says, "and we're concerned that the pool from which we draw our recruits ... is shrinking."